When you run out of something you regularly use, your first instinct is to run out and replace it. But what if you shopped from your own cabinet instead of the store? Stockpiling is one of the top strategies couponers use to never pay full price again. 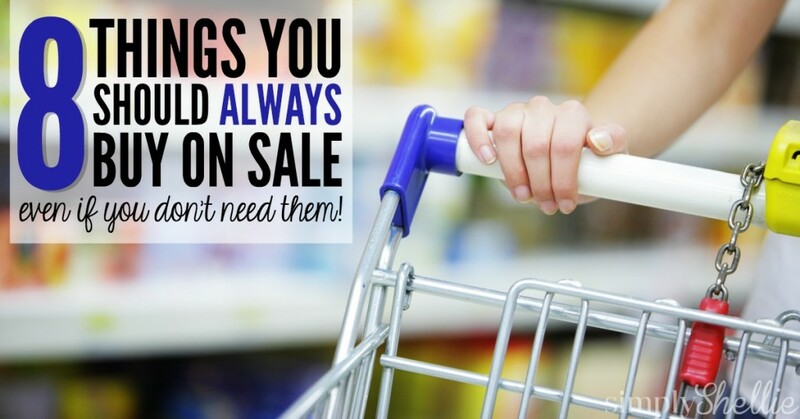 However, you don’t have to use coupons, to stock up and save! When an item you need goes on sale, grab a couple of extras and tuck them away. Then when you run out, grab an extra from your cabinet instead of racing out to the store and paying full price. Not sure if stockpiling is right for you? 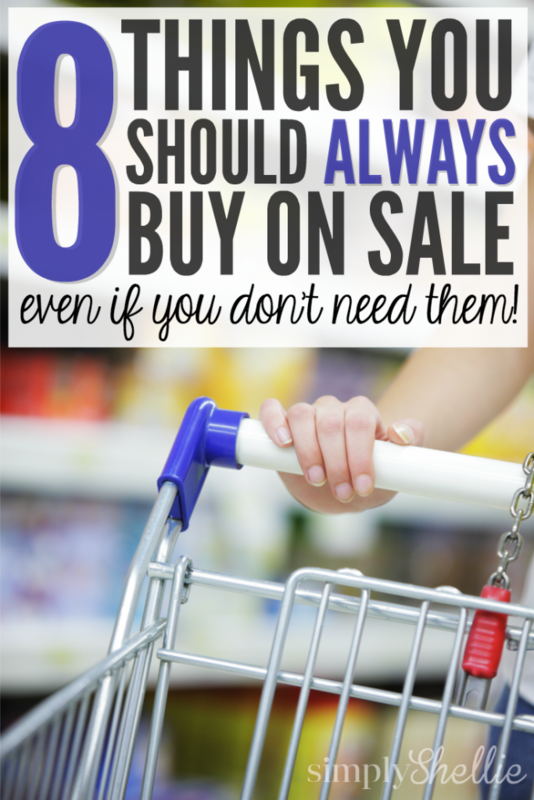 Here are my favorite 8 Things You Should Always Buy On Sale. Pick one, two or even all eight and see how much stockpiling can save your family. Everyone needs cleaning supplies and you likely don’t purchase them until you have run out. You can save quite a bit if you plan ahead and purchase your cleaning supplies when you see them on sale. This is especially helpful if you have a favorite brand. Look at the regular price of the item. If you find it for 40-50% off, grab an extra bottle or two to tuck away under your sink. If you have little ones, stockpiling diapers is one of the number one things you should be stockpiling. There is nothing worse than realizing you used the very last diaper and having to run out for a new pack in the middle of the night. Most families are also very brand loyal when it comes to diapers. Watch for gift card promos at Target or markdowns at your local grocery store. Diaper coupons are also plentiful. Even if you don’t use coupons, you might want to print a few to keep in your wallet. Most women don’t even consider stockpiling toiletries. Even if you use high-end salon products you can still find great sales and grab an extra bottle or two. Ulta Beauty stores have great sales and even offer coupons to make top salon brands more affordable. If you use grocery store brands you can really do well stockpiling. And don’t just stockpile Shampoo and Body Wash. You can see huge savings on razors when you purchase them on sale. Most dog and cat food is shelf stable and has a long expression date. If you find your favorite brand of food on sale, grab an extra bag so you aren’t paying full price when your furry friend runs out. You can also find great deals on treats, toys and cat litter if you shop sales. Lightbulbs are just one of those things that people never think about going on sale. We see great deals on CFL lightbulbs around Earth Day. I typically buy two boxes every April and they last me all year long! During the Back-To-School period in August we see huge discounts on office supplies. These are the lowest prices we see all year. In January when kids return after Winter break we see a few additional sales. Take advantage of these shopping seasons to grab enough copy paper, filler paper and pens to last all year. Batteries are like razors. One of those things you really need and they are pretty pricey. When you find discounts, be sure you grab an extra pack so you always have batteries available. Even better, start pricing the rechargeable batteries so you can use them again and again. If you shop diligently and keep your cabinets at a constant level, you can save a lot of money and always have your favorite products available. Also, if you are new to stockpiling, don’t miss my post with Simple Ways to Get Started Stockpiling!